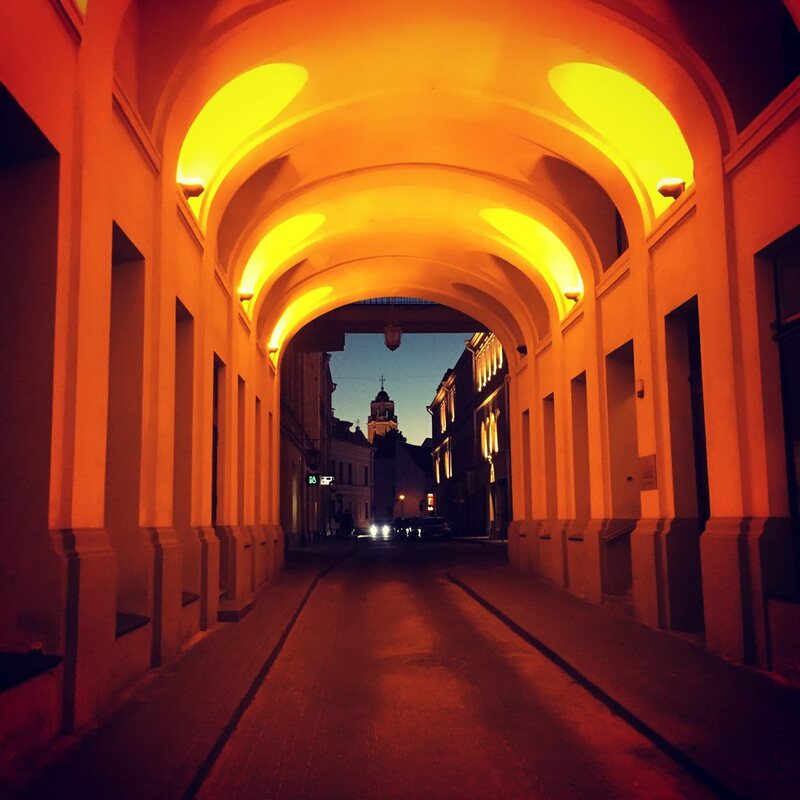 The last destination on our 3 week journey through the Baltic States was Vilnius, the capital city of Lithuania. 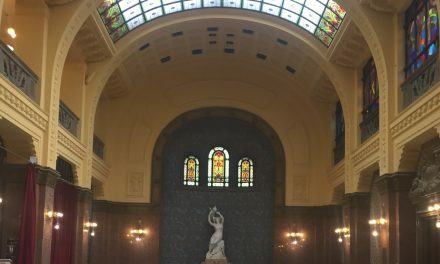 If you have read our previous Travel Tales, you will know we had a great bus trip from Tallinn to Riga, with the Ecolines Bus company, so it was an easy decision to use them to get to our next destination. A word of warning, should you be planning to travel from the Riga bus station. Do not buy food from the small stores located outside the building, go inside and order from the bakery. We made the mistake and hope to avert you doing so too. The small donut like thing we purchased was filled with what can only be described as rotten meat. We were again delighted to roll through the country side where the crops were ripening. Wild flowers danced in the breeze along the roadside and forests were interrupted by small villages made up of wooden houses. The bus was comfortable and the 4 hour trip flew by. We arrived in Vilnius about 3:00pm and were pleasantly surprised to note the city was quite modern, with wide streets and much greenery. It was a bit tricky to work out where the bus stop for our local bus was. They have an interesting system of alphabetically named bus stops. We were to catch our bus at G, however we noted that by the time the alphabet got to F, it then jumped to H. Confused? So were we. It finally turned out that they had placed G, on the other side of the square. Having solved this conundrum, we leapt aboard bus 1G and before we knew it, we were standing outside a large commercial complex which appeared to be our accommodation. More confusion! The apartment was located above the supermarket, shops and other commercial buildings and it turned out to be a little more luxurious than we had expected. Sometimes those AirBnb photos just do not do the apartment justice, set over 3 floors and with everything a traveller could need, including a luxurious deep bath (and the bubbles to go with it). Our trip to Vilnius was about half way through our “oldies gap year” and our routine had changed a bit since we first started out. We used to run straight out and explore, but by this time we were more inclined to spend our first night getting food for the week and settling into our new home away from home. Our host, Arturas popped in a little later and over a vino, filled us in on where to go and what to see in the city and surrounding region. You have to love a local tip or two when travelling. We also learned a little about the economic, ethnic and social situation in Lithuania and generally had a good old chat. The historic centre of Vilnius is well connected to the residential suburbs by bus. We alighted at the edge of the old town, just after crossing the river and made our way up the hill toward the town hall. One immediately senses the history, with cobblestones, cafes and numerous linen shops interspersed with ancient churches and civic buildings. Although the old town doesn’t appear to be on as grand a scale as Riga, it has a genuineness that casts one back into the 18th and 19th centuries. Cath took the opportunity to snap pictures here and there of some beautiful old buildings as we turned down a side alley and found ourselves in front of St Anne’s church. It is a lovely structure in red brick, which Arturus told us, Napolean had apparently instructed his troops to bring back to Paris. We’re glad they didn’t. As it happened, there were a couple of weddings taking place while we were there. No sooner was one bride out than the next one moved in, photographers arranging them for those special artistic album shots We kept moving, delighted to be in a town that was largely devoid of the travelling throngs of tour groups (there were a few, but easily avoided). We eventually climbed up the hill into the square with the town hall in it, when it became apparent that we needed to rest and recuperate from the heat. 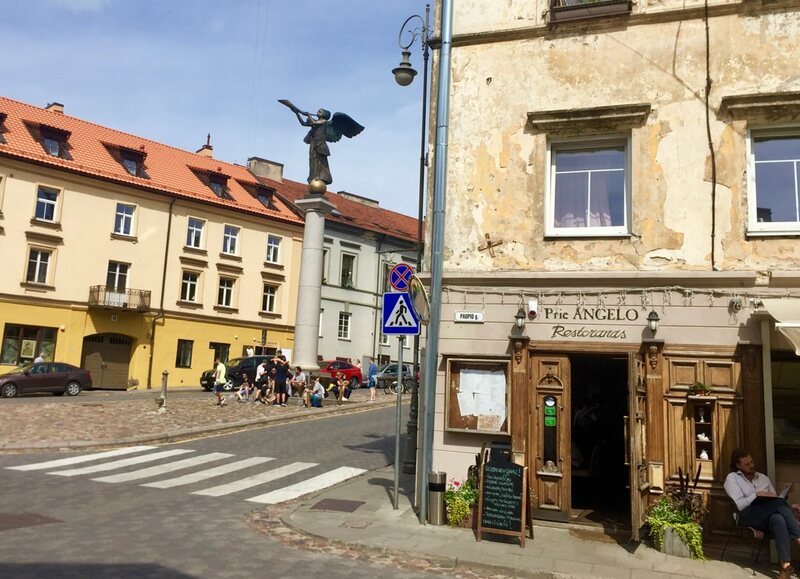 Uzupis is a district within the old town of Vilnius, which was traditionally the poorest area of the city but since Lithuania gained independence in 1991 the area has flourished and become a centre for art, festivals and cultural experiences. It is actually a self declared republic with it’s own constitution, president and even bishops. We spent a couple of hours wandering along the Vilnele River and then up into the narrow, cobblestoned streets. The area has the reputation of being the Montmartre of the Baltic states and we were delighted to find, it’s true. If a little less over run with tour groups! 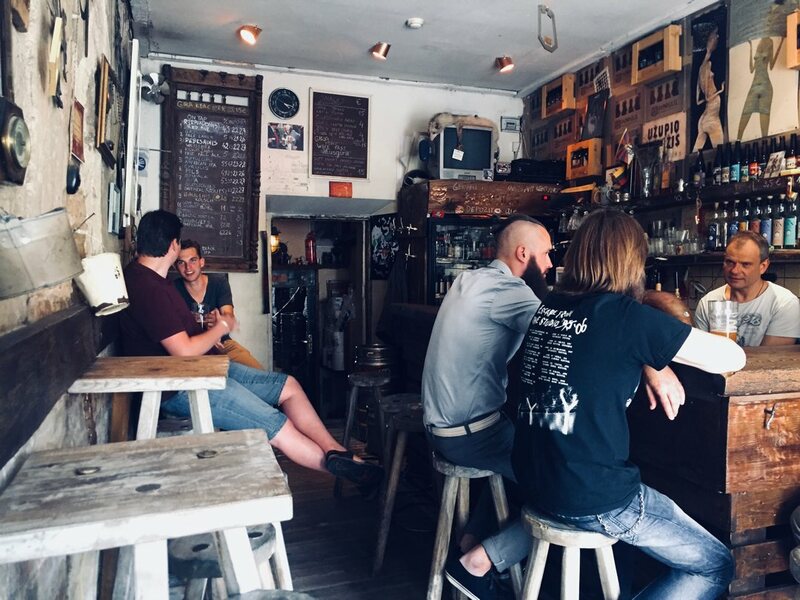 Arturus had told us about his favourite craft beer bar in the area, which also happens to be the smallest bar in Vilnius. 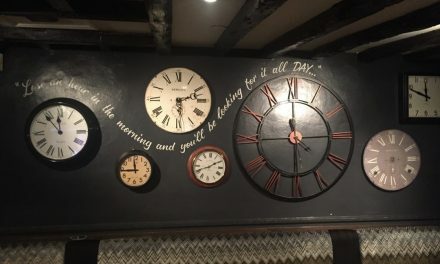 Spunka, is a tiny, quaint bar filled with an eclectic mix of memorabilia and a selection of locally brewed beers, perfect for watching the world go by on a warm, sunny Saturday afternoon. Which is exactly what we did. It is also conveniently located within the Uzupis Angel Square, so Cath got to take a few snaps of the famous talking statue. The Gate of Dawn, it’s surrounding churches and religious monuments are important historic and religious symbols to Lithuanians and people around the world. The Gate itself, has stood within the defensive city walls since at least 1522 A.D. Today it is a popular sight with tourists and locals. We meandered around the alley ways and admired the architecture, which it must be said is stunning as is the lighting of the historic buildings, before deciding that we had walked enough in one day to have a little treat. The Cafe Montmartre, seemed the appropriate spot given that we had spent the afternoon in the Paris like Uzupis. So we settled at a small table on the pavement, ordered a digestif, coffee and the yummiest dessert we had seen in a long while. Unfortunately, we arrived at the bus stop just in time to see the last bus heading in our direction pull out. Bummer! As it turned out, it was not such a bad thing, the Uber back to the apartment cost us €3.09. 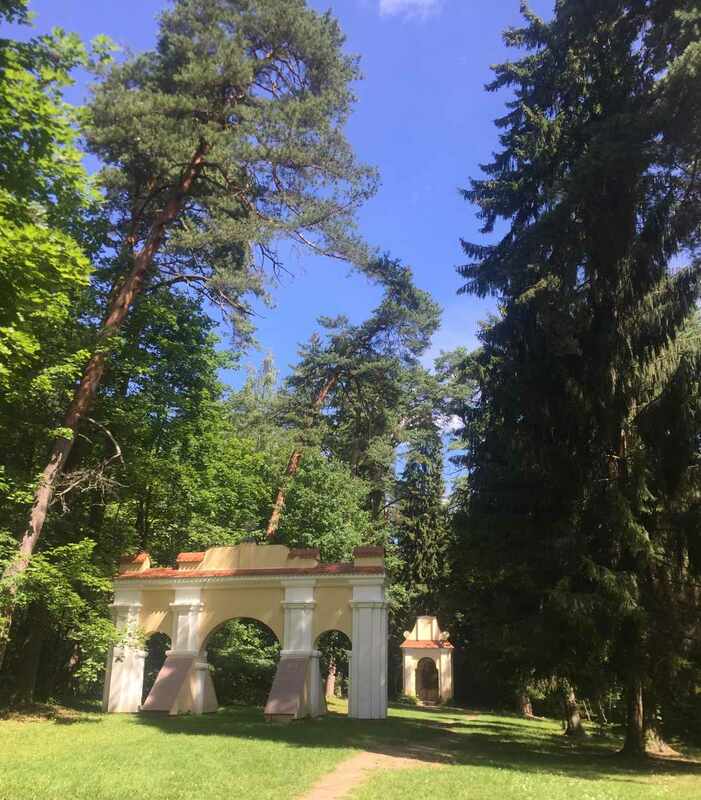 The Verkiai Regional Park, was located a short walk up the road from our accomodation and as Sunday is a quiet, family oriented day in Vilnius, we thought it best to get some exercise and explore the park. The Park is quite literally huge and at times we felt we were out walking in the forest, not right in the middle of the Lithuanian capital. There are myriad activities available in the park from hiring boats on the lakes to visiting grand palaces but we really just wanted to enjoy the sunshine and stretch our legs. As neither of us is religious, it may seem strange that we followed the Vilnius Kalvarijos, or way of the cross, a unique ensemble of 35 urban sculptures spaced out over a 7km route, with significance for religious pilgrims but it is a really easy way to navigate your way around the park. And you never know, the sacred spring near station XIII may just have those miraculous powers it is famed for. 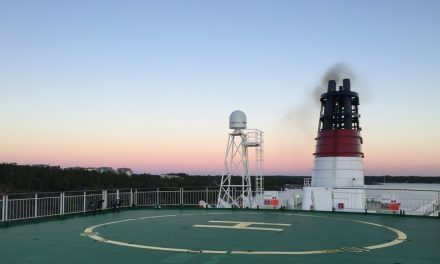 One of the many lessons we learnt whilst travelling for an extended period of time was that we just had to have days to do nothing or we just could not keep up our energy or enthusiasm. Thankfully our apartment in Vilnius was perfectly set up for long lazy mornings, luxurious bubble baths, reading, writing and of course organising the next steps in our travel itinerary. We could have used those days more effectively perhaps but as we are not getting any younger, we figure it is best to take it slow and steady. We were also lucky to have Arturus and his family to show us some of the sights around the city including a wonderful sunset walk in the parkland near the Verkiai Manor House and along the Neris River, where you can watch the hot air balloons float across the city skyline, if you are there at the right time of course. Figuring that we had not really seen the most of Vilnius due to the aforementioned lazy days, we made a concerted effort in our last two days to visit some more of the tourist sights and the old city but the weather did not always agree that we should be outside walking and we got caught in a huge rainstorm. Well what do you do but head to the pub for lunch? The Bix Baras (Beer Market) Pub is a cozy, alternative style venue which appears to have quite the live music scene too. It is located just inside the Gate of Dawn, perfect for escaping the rain during sight seeing. 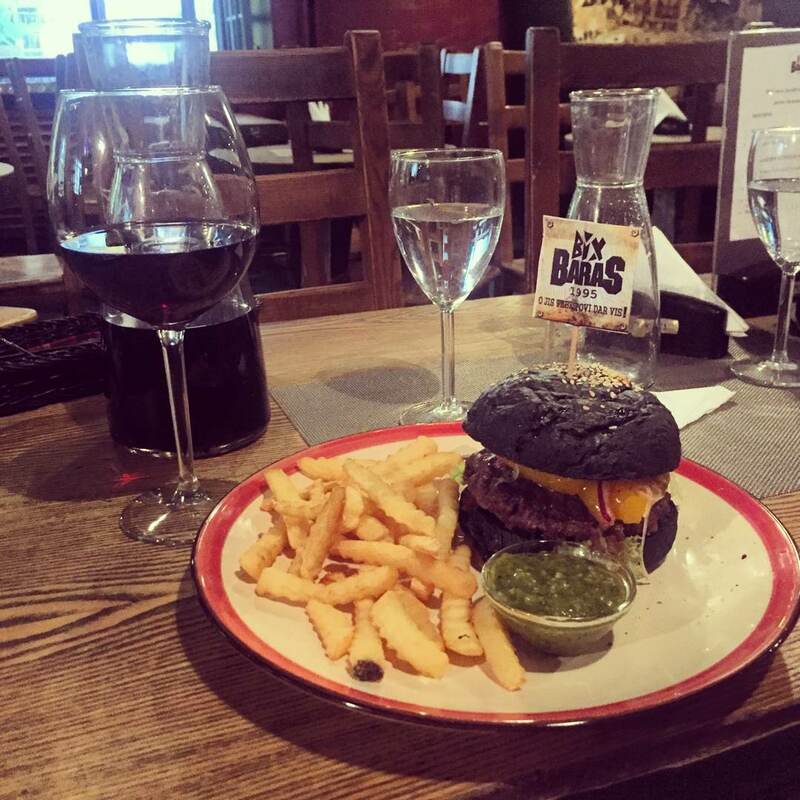 We settled into a nice little booth, ordered a carafe of wine and a black bun burger, yep you read it right, it was BLACK! But, it was super tasty and cheap the whole meal for two was $10€, including the quaffable red wine. As the rain had settled we were keen to continue our walk around the historic sights of the city and set off to enjoy a journey in yet another funicular. As you may have previously read in our blogs posts we have become quite taken with the little vehicles, that help us avoid walking all the way up the many European hills. 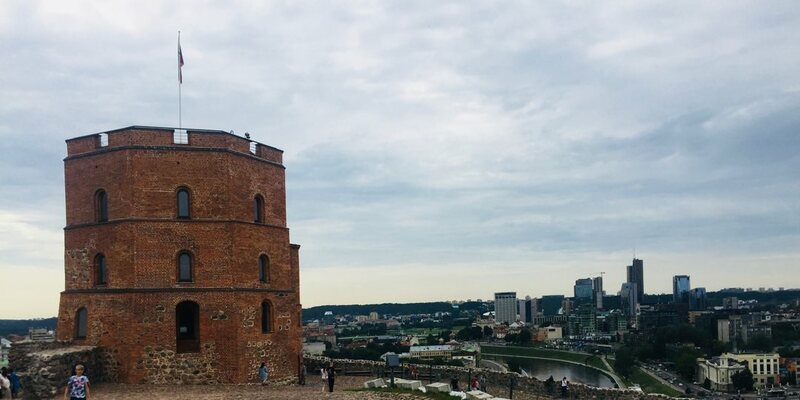 Gediminas’ Tower and Hill are the sight of the first castle built in Vilnius by Gediminas, the Grand Duke of Lithuania, in 1409. The current 3 storey tower was reconstructed in 1933 and gives a fantastic view over the city and surrounding country side, both the hill and the tower are part of the Lithuanian National Museum. We were mildly disappointed to find that the funicular was out of order during our visit, mildly that is until Cath realised that we had to climb the slippery cobblestoned hill and she had worn her trusty Havianna’s, not the best footwear choice of the trip. However the view of the river and city were worth the walk and whilst we again encountered the scourge of traveller’s everywhere, the selfie stick crew, there were few visitors and we could wander around at our leisure. 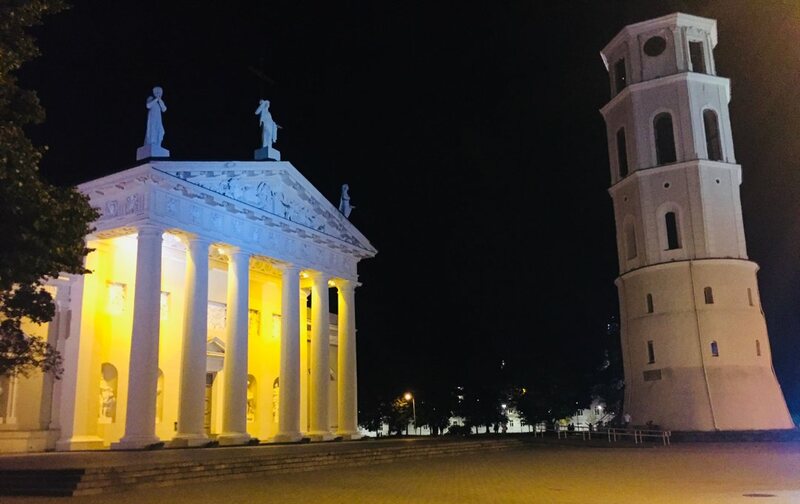 We meandered down the hill and along the riverside before heading back into the historic city, where we encountered the magnificent Vilnius Cathedral Basilica of Saints Stanislaus and Vladislaus and it’s wonderful leaning belfry tower. The Cathedral has lived through many renovations and the deprivations of the Soviet-era occupation, it was in fact originally part of the fortifications for the castle, above. The current interior has a stark, white almost modernist interior which dates to 1801. 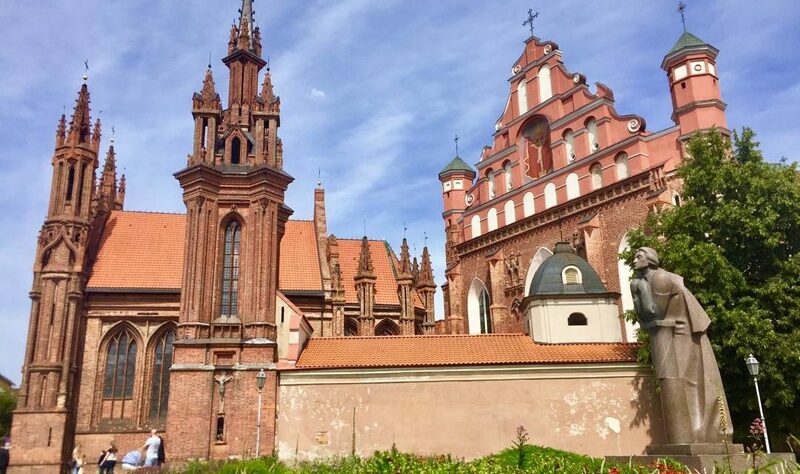 It is difficult to avoid visiting churches in Vilnius, as they appear on just about every street corner and have whole websites dedicated to visiting them. We are glad we decided to visit this one, as it is one of the few that avoided desecration and looting during the Soviet-era. Yet another reminder of the disturbing recent history of these old but yet so young countries, in the former soviet states. 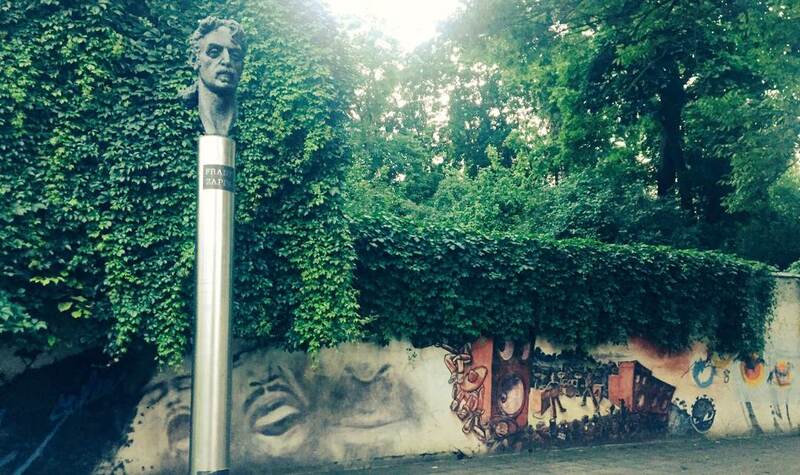 There are 15 talking statues representing local and not so local, contemporary artists throughout the capital of Lithuania. All you have to do is find them (you can access a map online), swipe your smart phone and listen to the recording. Sounds easy right? And it is, until you try to understand why Frank Zappa, avant guard art rock American musician and composer who never visited the city is there too. Ian, being a bit of a fan of the late and great Frank just had to find out more and Cath, who has had her ears assaulted with many a Zappa track, just had to go along for the walk. As the story goes, after declaring independence the Lithuanian people were wanting to replace the myriad of statues of Lenin and other Soviet leaders that had been on plinths throughout the city and did so with statues representing freedom, democracy and liberalism. Apparently Zappa fits this description. The park where the Zappa memorial and talking statue is located is right outside the children’s hospital and also contains a street art exhibition. On our final night in Vilnius we thought it best to enjoy an evening out “with the locals” and having consulted our very own city guide, Arturas, we set off to the square opposite the cathedral, a meeting point in the city for after work drinks and traditional but not touristy restaurants. We seated ourselves under the trees, at the pavement cocktail bar and grill, Zoe’s, ready to enjoy a cocktail and the warm summer evening but 45 minutes later, we still had not seen a waiter and yet a number of people had been seated, served and received their orders. Sensing that maybe speaking English had made it obvious that we weren’t locals, we decided to move on to a more visitor friendly environment. Now we should stress, this is the only place we have travelled where we have clearly not been welcome but as everyone knows it is becoming a not uncommon thing for tourists to not be welcome. Which for the record is fine with us, we will just take our spending money elsewhere and ensure that we tell everyone we know about our experience too. As it turned out it was a bit of a godsend as we found the cutest, little restaurant with a gorgeous courtyard and a traditional menu. 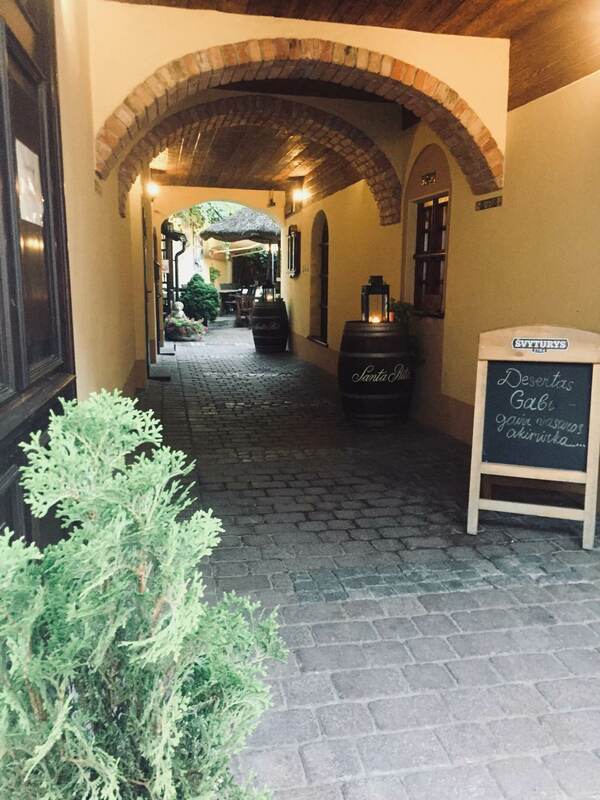 Gabi, is located in a renovated artisan’s cottage and home to many historic relics, photographs and a collection of vintage keys as well as a modern European and traditional Lithuanian menu. Oh and the wine list is extensive too. We settled into the courtyard, ordered a nice cool white wine and the traditional menu. The wine was perfect for a warm summer evening and the food was excellent although the cepelinai (zeppelin) were not so much to our Aussie tastes. Oh and the staff were friendly, even teaching us a few new words in Lithuanian. Ah, I love the Baltic States! I lived in Tallinn for a year and in a town about 2 hours outside of Riga for 4 months. Such beautiful places. We went to Lithuania, but not Vilnius. Hopefully one day. 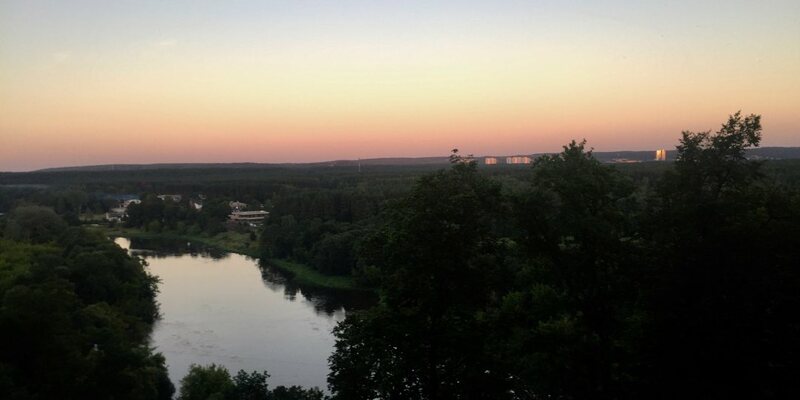 A friend recently had a trip to Lithuania and she loved it. By reading this article I see that it really has a lot to offer. I have to go! It’s good to learn about the place by spending a week there. However, a tourist might think there’s not much to see here. Vilnius looks absolutely amazing here! 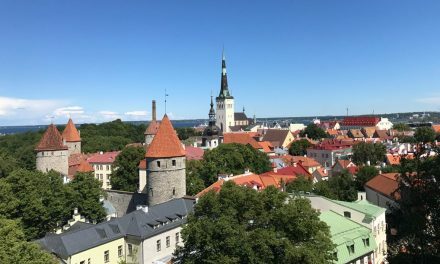 I’ve been reading up on this city as it seems so underrated together with the other Baltic nations of Estonia and Latvia, so it’s great to see what it has to offer from your post. I’d love to check out that stunning Old Town and the Gate of Tower as the architectural designs look absolutely magnificent. Looks like you had a fantastic trip! How horrid to feel unwelcome. That is really not a nice way to end a wonderful week. It just as well that you changed venues. You never know what’s around the corner! What is a traditional meal? Hi Janine, thanks for reading and commenting. A traditional Lithuanian meal is quite meaty, which we enjoyed but the potato zeppelin was not really to our taste, the apple crumble pie was as good as Grandma makes! Hi Daniele, thanks for reading and commenting we loved the Baltic States too? Are you planning another trip, maybe to Vilnius?